Greene’s Energy Group, LLC (GEG), a diversified oil service company and leading provider of integrated testing, rentals and specialty services, has been awarded a United States patent for its Closed Loop Separator, a step change in safety and solids handling for the oil and gas industry. This third generation system increases safety by preventing the release of gas on location during well completion and intervention operations. Gas separation is optimized significantly with the addition of a 10-inch diameter internal gas buster tube (more surface area for gas breakout) and an 8-inch diameter vertical vent (minimizes velocity spillover and reduces mist carryover). With the gas buster enclosed in the tank, the system can be completely sealed, is self-pressurized, safely contains all gas, and is able to securely transmit gas to the vent or flare. Further safety features of the system include level safety low/high shutdown controllers on the primary separator and a secondary level safety high shutdown controller on the gas buster (both are key safety differentiators on flowback operations). Greene’s Closed Loop Separator is specifically designed for high solids applications through reduced fluids velocity. This is accomplished by large diameter chambers for phase separation and quiet zone baffling. 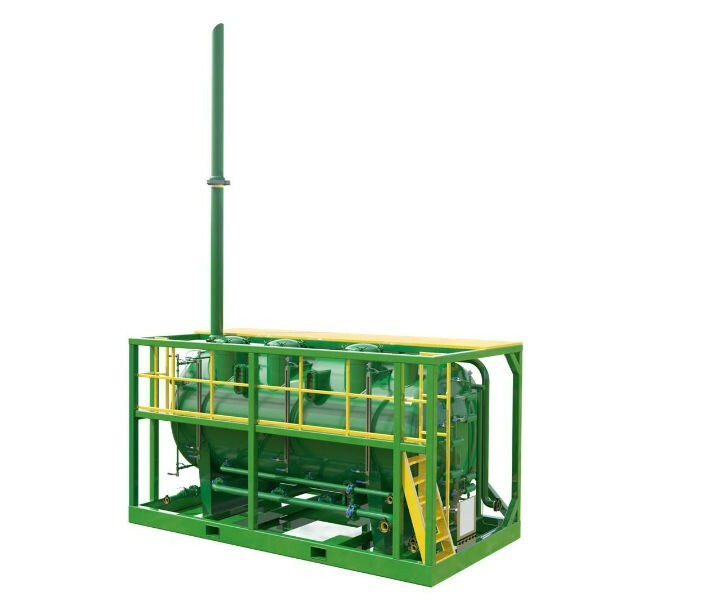 As a new standard for safe and efficient fluid handling, the Closed Loop Separator provides a four-phase hydraulic or atmospheric separation for gas, oil, water and solids and can be used in many onshore and offshore applications, including well stimulation and flowback operations; well intervention projects – including coiled tubing, wireline and pumping – including subsea wellhead to surface operations including flowlines, risers and umbilicals; and commissioning and decommissioning operations – including pipeline flushing, cleaning and testing. The separator can also be used to replace in-line platform production equipment for routine maintenance or equipment replacement periods. The Closed Loop Separator provides a four-phase hydraulic or atmospheric separation for gas, oil, water and solids and can be used in many onshore and offshore applications. Greene’s Closed Loop Separator is specifically designed for high solids applications through reduced fluids velocity.